Today I went to Parkmall to indulge myself in another delightful massage, my favorite hedonistic pleasure that I enjoy very much. 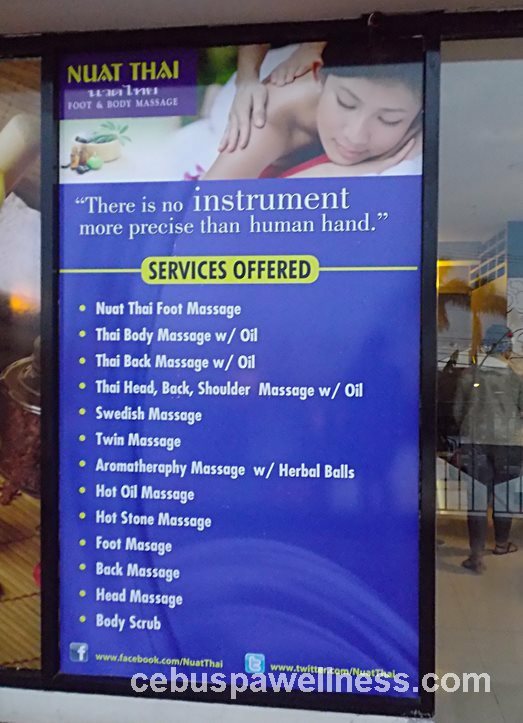 On the second floor, each side has several options for that quick massage fix but I picked Nuat Thai because it seems like an easy choice; It’s a brand almost everyone is familiar with. You see, Nuat Thai is as ubiquitous as Jollibee. Yes, that simply means they’re EVERYWHERE. It’s hard to miss this purple-and-yellow massage franchise since they are in almost every cities and towns in Cebu and other provinces. Sometimes when I don’t know what to choose, I just go with someone familiar just to get it over and done with. I love their chic and elegant interior design. Once inside Nuat Thai, your nostrils will be engulfed with that unmistakable peppermint smell that surrounds the entire place. I can’t help but feel like everyone is sniffing Vicks here. Haha. The front desk lady greeted me with the usual Filipino courtesy and handed me their menu of services. This time I’m trying out their aromatherapy massage which includes Thai herbal balls (interesting!) and waited for couple of minutes before starting because I just had dinner and I don’t want to spoil the mood by barfing all over the place. Afterwards, my massage therapist told me that she’s going to prepare my feet which I’m expecting would be a quick foot soak that’s usually done in most spas before the massage. I waited for her to come with a foot spa tub but to my surprise, she just sprayed my feet with water from a spray bottle and spread it all over. Boy, is this spa lazy! To cut corners like this is…just plain weird. I loved it when she used eucalyptus essential oil for the aromatherapy massage because it actually reminded of my childhood. Those days when I’m sick and my mother would slather that vapor rub on my chest. Priceless. It’s really ironic though that today I have to pay someone to relive those memories. Inside, a relaxing massage awaits. If you haven’t tried it yet. You should. I absolutely love how the warm Thai herbal balls feels cozy on my body. It somehow rejuvenated my tired and sore muscles and calmed my nerves. Just make sure to inform your therapist if it’s too hot because they might not realize that it was warmed a little too strongly than what your skin can handle. There are risks involved and getting your skin burned is one of them. While I’m trying to luxuriate myself in aromatherapy bliss, I heard these subdued chitchat, I’m assuming from the spa staff. Obviously some employees just don’t care that I can hear them otherwise they would have shut up and do their personal business outside while waiting for their customers. I should probably get used to this because clearly this is prevalent in most cheap spas that I go to. But no I won’t. Consumers should never tolerate these blatant mindlessness because these folks are paid to work and not make vacant cubicles their breakout session. It’s our right to demand professionalism in every spas here in our country because it’s part of what we paid for. The only way we can encourage more people to patronize our spas and thereby uplift our God-forsaken economy is when these people know what they’re doing. A tea after the massage. Nice. The 1 ½ hour aromatherapy massage was awesome. My therapists hit all the right spots and feel revitalized going home. For P380, it’s okay. But would I come back and book myself another massage with Nuat Thai? Probably not. Don’t get me wrong. I like how my massage therapist had done her part but Nuat Thai as a spa can do so much better. Just like any other spas, they should learn that they don’t just exist to recoup their capitalistic ventures but to satisfy their customers–the very reason why they have survived all these years. Some of their spa therapists are too complacent to even care. They forgot that some customers remember every detail of their experience and some blogs about it (like me). I know, it’s hard to generalize a brand with the mistake of one bad egg. Of course, not everyone is like that. But you have to understand, it’s a franchise. They operate on the same brand regardless of the location and owner. Cebu is littered with thousands of spas like mushrooms sprouting out of nowhere. My experience today had me convinced to try them out first rather than come back at Nuat Thai and endure another major letdown. DISCLAIMER: The unbiased opinions expressed in this blog post are entirely my own and drawn from my personal experience. If you have any questions or clarifications, contact me. I understand your comment. But also understand this. Even as most masseuses, will do they best to give you the best experience possible, they are only human. The work 14 hours a day, for a very low salary. You cannot always blame the masseuse what goes wrong. That they got only 40 P or less on a massage is no reason not to be motivated, but after a tiring week, it not help always, which again is not an excuse. Many people not understand that the owners get almost all what you pay for, and the girls have it not always easy. They have no reason to not treat you well,as all they can hope for, to get a little bit a tip. If they not get any, it is really hard for them to go home with some decent pay. Hi, Martin. Thanks for dropping by. I also feed bad that the masseuse here in the Philippines are not paid enough to make decent living which is why I make it a habit to give tips for a splendid service whenever I can. My only gripe from this Nuat Thai branch was their lack of sensitivity especially to customers who go to their spa to relax. You can’t relax if you hear people talking loudly. I sincerely hope that the management will do something about this.